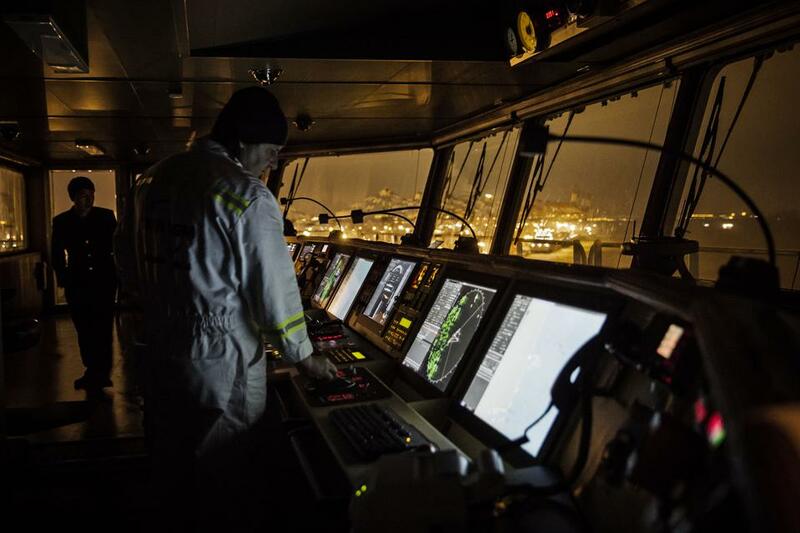 Paval Botica, chief officer on CMA CGM's Benjamin Franklin container ship, checks a monitor off Guangzhou, China, in 2016.
a first step toward autonomous operation. The next time you hop on a ferry, take a look at the captain’s bridge. There may not be a human at the helm much longer. Ships around the world are beginning a transformation into autonomous machines, leveraging the same advances in artificial intelligence that are shaking up the automotive world. Reading that more than 80% of goods are transported by sea, a light bulb went off, says Vollmer. “We can have a very huge impact,” he remembers thinking. The French engineers started tinkering with robotizing a small boat along with another friend friend, Antoine de Maleprade. Within three months of joining the incubator Y Combinator in January 2018, their startup Shone struck a deal with the big French shipping line CMA CGM to install a system on cargo ships plying trans-Pacific routes that detects surrounding ships and obstacles. Shone fuses data from multiple sensors (radar, camera, AIS, etc.) in order to increase detection accuracy, thus preventing potential collisions, taking into account COLREGs. Shone is one of a wave of companies that are seeking to robotize ships using artificial intelligence to fuse data from shipboard sensors like radar and cameras to create a picture of the hazards around a ship and to navigate among them. Autonomous and remote-controlled shipping promises to reduce the costs of consumer goods and improve safety for passenger ferries and cruise liners. The first commercial vessels likely to operate autonomously at least part of the time are expected to be tugboats and small ferries traveling short routes—the technology could enable an expansion of passenger service into thinly traveled early morning hours and in rural locations. In 2017, Rolls-Royce signed a deal with Google to develop intelligent awareness systems for future autonomous ships. The autonomous ships market size is expected to grow from USD 6.1 billion in 2018 to USD 13.8 billion by 2030, at a Compound Annual Growth Rate (CAGR) of 7.00% during the forecast period. However, autonomy will play out very differently on the water than on land, and in many cases it won’t take humans off the ship—or entirely away from the controls. Rather than just replacing one driver of a car or truck, oceangoing ships can have 20 or more crew members onboard, some of whom tend to a range of mechanical systems en route. “Diesel engines require replacement of filters in oil systems—the fuel system has a separator than can get clogged,” says Oskar Levander, who heads Roll-Royce’s autonomous systems efforts. In the near term, it’s more likely that the helm will be controlled by an autonomous system or a remote human operator while a smaller crew takes care of the vessel. Transoceanic autonomous journeys will require rule-making by the International Maritime Organization, a process that could take through the middle of the next decade. The first commercial applications of autonomous systems are likely to be on small vessels in coastal waters in Scandinavia, where Finland and Norway have staked out testing areas. In December in Finland, Rolls-Royce pulled off the first public demonstration of an autonomous voyage by a passenger vessel, a state-run car ferry that avoided obstacles on a 1-mile route and docked automatically. On that day and in previous trials, Rolls-Royce says the system performed ably in rough winter weather, handling snow and strong winds. Small ferries are a key part of the transportation network in Scandinavia, carrying cars across fjords and connecting to islands. Autonomous and remote control systems could allow for an expansion of service on short routes into nighttime hours, and reduce staffing on less popular ones, with boats potentially piloted from onshore centers where one captain could supervise many, says Levander. The tugboat market also has a good near-term business case for autonomy and remote control, says Levander. “There’s a very attractive payback time, crew costs are high,” he says. Rolls-Royce demonstrated remote control of a tugboat in Copenhagen in 2017 working with Svister, a tug operator owned by Maersk. A Boston-based startup called Sea Machines is also developing autonomous and remote-control systems for tugs, ferries and other workboats. The ferries between Horten and Moss in Norway will now go alongside automatically. Kongsberg Maritime is installing technology onboard to increase safety, improve passenger experience and reduce fuel consumption. In 2020, the Norse conglomerate Kongsberg, which is acquiring Rolls-Royce's marine unit, will launch the world’s first electric containership designed to be autonomous, the YARA Birkehead. The vessel, which is on the smaller side with capacity for 120 shipping containers, will carry fertilizer in Norwegian waters from a YARA plant to nearby ports to be transferred to larger vessels for export. Rolls-Royce’s Levander and many in the industry believe new-build electric vessels will be the ideal platform to robotize cargo shipping—electric propulsion systems will have fewer moving parts and require less maintenance. But it will take decades for cargo fleets to turn over—vessels typically stay in service for about 20 years—and batteries don’t have enough energy density yet to power ships for cross-ocean voyages. Shone is staking its business on retrofitting existing cargo ships. In certain ways it’s easier to make ships autonomous than automobiles. Large ships already have marine-tested sensor systems that can be plugged into: radar, GPS and a transponder-based automatic identification system. Shone adds 360-degree cameras and microphones and uses artificial intelligence to fuse the sensor data into an object detection system that displays an integrated picture of a ship’s surroundings for the crew on an iPad. Microphones can pick up a ship’s horn and by algorithm the system can pinpoint its location. The system also add layers of intelligence, says Vollmer. At this point that’s the extent of what the system does. In the spring Vollmer says it will begin recommending courses of action for the ship’s helm to take, from obstacle avoidance to optimizing routes, building trust for the final step, when it’s permissible: taking automatic action. Shone is installing its system for a price “in the hundreds of thousands,” says Vollmer, and a recurring fee for service. It’s a small amount, he says, compared to the $200 million price for a cargo vessel, and contrasts to the cost issues that autonomous sensor suites raise for cars. In the near future cargo ships are only likely to operate autonomously on the open ocean, says Levander, because of the difficulty and expense of creating a system capable of handling the most complex situations that ships encounter. 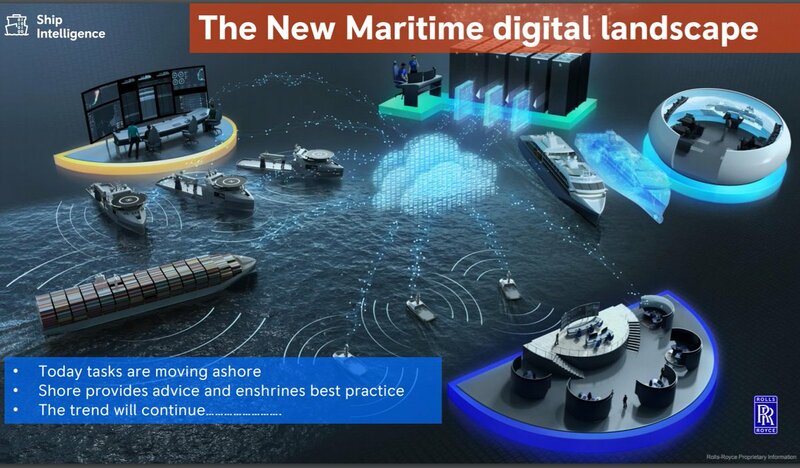 Going in and out of port the ship would be controlled remotely by a captain in a center onshore, with video and other data streaming over land-based 4G and 5G networks. Out on open water, the ship would switch to autonomous mode, which wouldn’t require as much data transmittal, with captains ashore standing by to take over as needed, aided by satellite communications. With more jobs on shore, Levander says it will provide a better, safer life for some seafarers. And that means taking sailors out of harm’s way. “We can provide a better life for the seafarer,” says Levander.